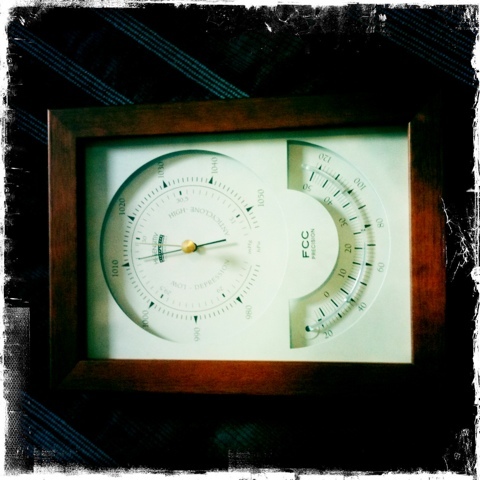 In the hallway of the house I grew up in was a barometer. Measuring atmospheric pressure, it was routinely tapped to see if any movement had happened to indicate what the weather could be like. Being England, the weather did what it wanted to do, but I can remember the long heady days of summer where the barometer sat high, the skies were blue and my brother and I lived on the beach. Photos of us as children show us nut-brown, hair bleached in the sun. Then the miserable gloom of winter where the needle sat low and hulking, boding cold, grey ‘dreich’ days that stretched endlessly into one another; but which did mean hours of gin rummy; dominos; getting thrashed by Granny at Scrabble; or ‘Beetle’; arguing over Old Kent Road and Mayfair in Monopoly; or simply curled up reading. This barometer was given to me by my parents, because when prompted about ‘Is there anything you’d like for your birthday’ I asked for one, as any house I lived in after I left home felt naked without one in. It’s a funny thing for a girl to request. It’s fragile, but has moved house repeatedly with me, and travelled to Australia in our ship-bound boxes. It’s one of the last things I pack, and one of the first things hung up. And I still tap the glass daily. Oh, I love that you still tap it daily!